The rate of intravenous fosphenytoin sodium injection administration should not exceed 150 mg phenytoin sodium equivalents (PE) per minute in adults and 2 mg PE/kg/min (or 150 mg PE/min, whichever is slower) in pediatric patients because of the risk of severe hypotension and cardiac arrhythmias. Careful cardiac monitoring is needed during and after administering intravenous fosphenytoin sodium injection. Although the risk of cardiovascular toxicity increases with infusion rates above the recommended infusion rate, these events have also been reported at or below the recommended infusion rate. Reduction in rate of administration or discontinuation of dosing may be needed [see Dosage and Administration (2.3, 2.4)andWarnings and Precautions (5.2)]. These highlights do not include all the information needed to use FOSPHENYTOIN SODIUM INJECTION safely and effectively. See full prescribing information for FOSPHENYTOIN SODIUM INJECTION. FOSPHENYTOIN SODIUM injection, for intravenous or intramuscular use. The rate of intravenous fosphenytoin sodium injection administration should not exceed 150 mg phenytoin sodium equivalents (PE) per minute in adults and 2 mg PE/kg/min (or 150 mg PE/min, whichever is slower) in pediatric patients because of the risk of severe hypotension and cardiac arrhythmias. Careful cardiac monitoring is needed during and after administering intravenous fosphenytoin sodium injection. Fosphenytoin sodium injection is indicated for the treatment of generalized tonic-clonic status epilepticus and prevention and treatment of seizures occurring during neurosurgery. Fosphenytoin sodium injection can also be substituted, short-term, for oral phenytoin. Fosphenytoin sodium injection should be used only when oral phenytoin administration is not possible [see Dosage and Administration (2.4)and Warnings and Precautions (5.2)]. Use caution when administering fosphenytoin sodium injection because of the risk of dosing errors [see Warnings and Precautions (5.1)]. The dose, concentration, and infusion rate of fosphenytoin sodium injection should always be expressed as phenytoin sodium equivalents (PE). There is no need to perform molecular weightbased adjustments when converting between fosphenytoin and phenytoin sodium doses. fosphenytoin sodium injection should always be prescribed and dispensed in phenytoin sodium equivalent units (PE). The amount and concentration of fosphenytoin is always expressed in terms of mg of phenytoin sodium equivalents (mg PE). Do not confuse the concentration of fosphenytoin sodium injection with the total amount of drug in the vial. Errors, including fatal overdoses, have occurred when the concentration of the vial (50 mg PE/mL) was misinterpreted to mean that the total content of the vial was 50 mg PE. These errors have resulted in two- or ten- fold overdoses of fosphenytoin sodium injection since each of the vials actually contains a total of 100 mg PE (2 mL vial) or 500 mg PE (10 mL vial). Ensure the appropriate volume of fosphenytoin sodium injection is withdrawn from the vial when preparing the dose for administration. Attention to these details may prevent some fosphenytoin sodium injection medication errors from occurring. Prior to intravenous (IV) infusion, dilute fosphenytoin sodium injection in 5% dextrose or 0.9% saline solution for injection to a concentration ranging from 1.5 to 25 mg PE/mL. The maximum concentration of fosphenytoin sodium injection in any solution should be 25 mg PE/mL. When fosphenytoin sodium injection is given as an intravenous infusion, fosphenytoin sodium injection needs to be diluted and should only be administered at a rate not exceeding 150 mg PE/min. Because of the risk of hypotension and cardiac arrhythmias, the rate of administration for IV fosphenytoin sodium injection should be no greater than 150 mg PE/min in adults and 2 mg PE/kg/min (or 150 mg PE/min, whichever is slower) in pediatric patients [see Warnings and Precautions (5.2) ]. Continuous monitoring of the electrocardiogram, blood pressure, and respiratory function is essential and the patient should be observed throughout the period where maximal serum phenytoin concentrations occur, approximately 10 to 20 minutes after the end of fosphenytoin sodium injection infusions. The loading dose should be followed by maintenance doses of either fosphenytoin sodium injection or phenytoin [see Dosage and Administration (2.4)]. Even though loading doses of fosphenytoin sodium injection have been given by the IM route for other indications when IV access is impossible, IM fosphenytoin sodium injection should ordinarily not be used in the treatment of status epilepticus because therapeutic phenytoin concentrations may not be reached as quickly as with IV administration. The loading dose of fosphenytoin sodium injection is 15 to 20 mg PE/kg at a rate of 2 mg PE/kg/min (or 150 mg PE/min, whichever is slower). Intramuscular administration of fosphenytoin sodium injection should ordinarily not be used in pediatric patients. When IV access has been impossible, loading doses of fosphenytoin sodium injection have been given by the IM route. Because of the risk of hypotension and cardiac arrhythmias, the rate of administration for IV fosphenytoin sodium injection should be no greater than 150 mg PE/min in adults. For loading doses in pediatric patients, the rate should not exceed 2 mg PE/kg/min (or 150 mg PE/min, whichever is slower). For maintenance doses in pediatric patients, the rate should not exceed 1 to2 mg PE/kg/min (or 100 mg PE/min, whichever is slower). Continuous monitoring of the electrocardiogram, blood pressure, and respiratory function is essential and the patient should be 3 observed throughout the period where maximal serum phenytoin concentrations occur (approximately 10 to 20 minutes after the end of fosphenytoin sodium injection infusions). After the initial maintenance dose, subsequent maintenance doses should be individualized by monitoring serum phenytoin concentrations to achieve a target therapeutic concentration of phenytoin [see Dosage and Administration (2.5)and Warnings and Precautions (5.17)]. Because of the risks of cardiac and local toxicity associated with intravenous fosphenytoin sodium injection, oral phenytoin should be used whenever possible. The non-emergent loading dose of fosphenytoin sodium injection is 10 to 20 mg PE/kg given IV or IM. Following either the loading dose for Status Epilepticus or a Non-emergent situation, the initial daily maintenance dose of fosphenytoin sodium injection is 4 to 6 mg PE/kg/day in divided doses at a rate no greater than 150 mg PE/min. After administration of a loading dose, maintenance doses should be started at the next identified dosing interval. Because of the risks of cardiac and local toxicity associated with intravenous fosphenytoin sodium injection, oral phenytoin should be used whenever possible. Intramuscular administration of fosphenytoin sodium injection should ordinarily not be used in pediatric patients. The non-emergent loading dose of fosphenytoin sodium injection is 10 to 15 mg PE/kg at a rate of 1 to 2 mg PE/kg/min (or 150 mg PE/min, whichever is slower). Following either the loading dose for Status Epilepticus or a Non-Emergent situation, the initial maintenance dose of fosphenytoin sodium injection is 2 to 4 mg PE/kg which should be given 12 hours after the loading dose and then continued every 12 hours (4 to 8 mg PE/kg/day in divided doses) at a rate of 1 to 2 mg PE/kg/min (or 100 mg PE/min, whichever is slower). 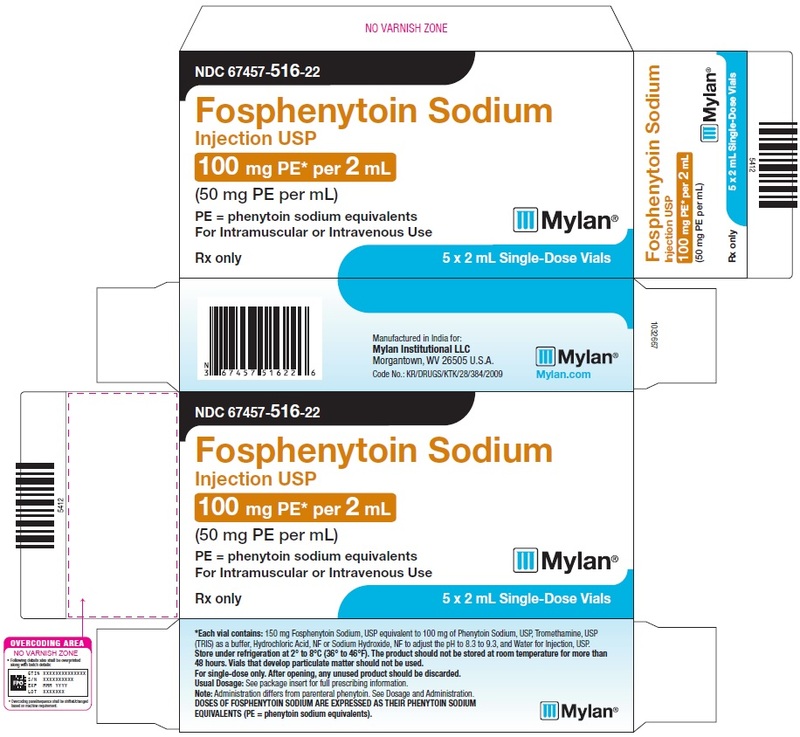 Fosphenytoin sodium injection (or phenytoin) doses are usually selected to attain therapeutic serum total phenytoin concentrations of 10 to 20 mcg/mL (unbound phenytoin concentrations of 1 to 2 mcg/mL). Following fosphenytoin sodium injection administration, it is recommended that phenytoin concentrations not be monitored until conversion to phenytoin is essentially complete.This occurs within approximately 2 hours after the end of IV infusion and 4 hours after intramuscular (IM) injection. Prior to complete conversion, commonly used immunoanalytical techniques, such as TDx®/TDxFLxTM (fluorescence polarization) and Emit® 2000 (enzyme multiplied), may significantly overestimate serum phenytoin concentrations because of crossreactivity with fosphenytoin. The error is dependent on serum phenytoin and fosphenytoin concentration (influenced by fosphenytoin sodium injection dose, route and rate of administration, and time of sampling relative to dosing), and analytical method. Chromatographic assay methods accurately quantitate phenytoin concentrations in biological fluids in the presence of fosphenytoin. Prior to complete conversion, blood samples for phenytoin monitoring should be collected in tubes containing EDTA as an anticoagulant to minimize ex vivo conversion of fosphenytoin to phenytoin. However, even with specific assay methods, phenytoin concentrations measured before conversion of fosphenytoin is complete will not reflect phenytoin concentrations ultimately achieved. Trough levels provide information about clinically effective serum level range and are obtained just prior to the patient’s next scheduled dose. Peak levels indicate an individual’s threshold for emergence of dose-related side effects and are obtained at the time of expected peak concentration. Therapeutic effect without clinical signs of toxicity occurs more often with serum total phenytoin concentrations between 10 and 20 mcg/mL (unbound phenytoin concentrations of 1 to 2 mcg/mL), although some mild cases of tonic-clonic (grand mal) epilepsy may be controlled with lower serum levels of phenytoin. In patients with renal or hepatic disease, or in those with hypoalbuminemia, the monitoring of unbound phenytoin concentrations may be more relevant [see Dosage and Administration (2.7)]. When treatment with oral phenytoin is not possible, fosphenytoin sodium injection can be substituted for oral phenytoin at the same total daily phenytoin sodium equivalents (PE) dose. Dilantin capsules are approximately 90% bioavailable by the oral route. Phenytoin, derived from administration of fosphenytoin sodium injection, is 100% bioavailable by both the IM and IV routes. For this reason, serum phenytoin concentrations may increase modestly when IM or IV fosphenytoin sodium injection is substituted for oral phenytoin sodium therapy. The rate of administration for IV fosphenytoin sodium injection should be no greater than 150 mg PE/min in adults and 2 mg PE/kg/min (or 150 mg PE/min, whichever is slower) in pediatric patients. In controlled trials, IM fosphenytoin sodium injection was administered as a single daily dose utilizing either 1 or 2 injection sites. Some patients may require more frequent dosing. Intramuscular administration of fosphenytoin sodium injection should ordinarily not be used in pediatric patients. Because the fraction of unbound phenytoin (the active metabolite of fosphenytoin sodium injection) is increased in patients with renal or hepatic disease, or in those with hypoalbuminemia, the monitoring of phenytoin serum levels should be based on the unbound fraction in those patients. After IV fosphenytoin sodium injection administration to patients with renal and/or hepatic disease, or in those with hypoalbuminemia, fosphenytoin clearance to phenytoin may be increased without a similar increase in phenytoin clearance. This has the potential to increase the frequency and severity of adverse events [see Warnings and Precautions (5.12)]. The clearance of phenytoin (the active metabolite of fosphenytoin sodium injection) is decreased slightly in elderly patients and lower or less frequent dosing may be required [see Clinical Pharmacology (12.3)]. Decreased serum concentrations of phenytoin (the active metabolite of fosphenytoin sodium injection) may occur during pregnancy because of altered phenytoin pharmacokinetics [see Clinical Pharmacology (12.3)]. Periodic measurement of serum phenytoin concentrations shouldbe performed during pregnancy, and the fosphenytoin sodium injection dosage should beadjusted as necessary. Postpartum restoration of the original dosage will probably be indicated [see Use in Specific Populations (8.1)]. Because of potential changes in protein binding duringpregnancy, the monitoring of phenytoin serum levels should be based on the unbound fraction. A history of hypersensitivity to fosphenytoin sodium injection or its inactive ingredients, or to phenytoin or other hydantoins [see Warnings and Precautions (5.6)]. A history of prior acute hepatotoxicity attributable to fosphenytoin sodium injection or phenytoin [see Warnings and Precautions (5.7)]. Co-administration with delavirdine because of the potential for loss of virologic response and possible resistance to delavirdine or to the class of non-nucleoside reverse transcriptase inhibitors. Doses of fosphenytoin sodium injection are always expressed in terms of milligrams of phenytoin sodium equivalents (mg PE). 1 mg PE is equivalent to 1 mg phenytoin sodium. Do not, therefore, make any adjustment in the recommended doses when substituting fosphenytoin sodium injection for phenytoin sodium or vice versa. For example, if a patient is receiving 1,000 mg PE of fosphenytoin sodium injection, that is equivalent to 1,000 mg of phenytoin sodium. Medication errors associated with fosphenytoin sodium injection have resulted in patients receiving the wrong dose of fosphenytoin. Fosphenytoin sodium injection is marketed in 2 mL vials containing a total of 100 mg PE and 10 mL vials containing a total of 500 mg PE. The concentration of each vial is 50 mg PE/mL. Errors have occurred when the concentration of the vial (50 mg PE/mL) was misinterpreted to mean that the total content of the vial was 50 mg PE. These errors have resulted in two- or ten-fold overdoses of fosphenytoin sodium injection since each vial actually contains a total of 100 mg PE or 500 mg PE. In some cases, ten-fold overdoses were associated with fatal outcomes. To help minimize confusion, the prescribed dose of fosphenytoin sodium injection should always be expressed in milligrams of phenytoin equivalents (mg PE) [see Dosage and Administration (2.1)]. Additionally, when ordering and storing fosphenytoin sodium injection, consider displaying the total drug content (i.e., 100 mg PE/ 2 mL or 500 mg PE/ 10 mL) instead of concentration in computer systems, pre-printed orders, and automated dispensing cabinet databases to help ensure that total drug content can be clearly identified. Care should be taken to ensure the appropriate volume of fosphenytoin sodium injection is withdrawn from the vial when preparing the drug for administration. Attention to these details may prevent some fosphenytoin sodium injection medication errors from occurring. Rapid intravenous administration of fosphenytoin sodium injection increases the risk of adverse cardiovascular reactions, including severe hypotension and cardiac arrhythmias. Cardiac arrhythmias have included bradycardia, heart block, QT interval prolongation, ventricular tachycardia, and ventricular fibrillation which have resulted in asystole, cardiac arrest, and death. Severe complications are most commonly encountered in critically ill patients, elderly patients, and patients with hypotension and severe myocardial insufficiency. However, cardiac events have also been reported in adults and children without underlying cardiac disease or comorbidities and at recommended doses and infusion rates. The rate of intravenous fosphenytoin sodium injection administration should not exceed 150 mg phenytoin sodium equivalents (PE) per minute in adults and 2 mg PE/kg/min (or 150 mg PE/min, whichever is slower) in pediatric patients [see Dosage and Administration (2.3, 2.4)]. As non-emergency therapy, intravenous fosphenytoin sodium injection should be administered more slowly. Because of the risks of cardiac and local toxicity associated with IV fosphenytoin sodium injection, oral phenytoin should be used whenever possible. Because adverse cardiovascular reactions have occurred during and after infusions, careful cardiac and respiratory monitoring is needed during and after the administration of intravenous fosphenytoin sodium injection. Reduction in rate of administration or discontinuation of dosing may be needed. Serious and sometimes fatal dermatologic reactions, including toxic epidermal necrolysis(TEN) and Stevens-Johnson syndrome (SJS), have been reported with phenytoin (the active metabolite of fosphenytoin sodium injection) treatment. The onset of symptoms is usually within 28 days, but can occur later. Fosphenytoin sodium injection should be discontinued at the first sign of a rash, unless the rash is clearly not drug-related. If signs or symptoms suggest SJS/TEN, use of this drug should not be resumed and alternative therapy should be considered. If a rash occurs,the patient should be evaluated for signs and symptoms of Drug Reaction with Eosinophilia and Systemic Symptoms (DRESS) [see Warnings and Precautions (5.5)]. Studies in patients of Chinese ancestry have found a strong association between the risk of developing SJS/TEN and the presence of HLA-B*1502, an inherited allelic variant of the HLA B gene, in patients using carbamazepine. Limited evidence suggests that HLA-B*1502 may be a risk factor for the development of SJS/TEN in patients of Asian ancestry taking other antiepileptic drugs associated with SJS/TEN, including phenytoin. Consideration should be given to avoiding fosphenytoin sodium injection as an alternative for carbamazepine patients positive for HLA- B*1502. Drug Reaction with Eosinophilia and Systemic Symptoms (DRESS), also known as Multiorgan hypersensitivity, has been reported in patients taking antiepileptic drugs, including phenytoin and fosphenytoin sodium injection. Some of these events have been fatal or life-threatening. DRESS typically, although not exclusively, presents with fever, rash, lymphadenopathy, and/or facial swelling, in association with other organ system involvement, such as hepatitis, nephritis, hematological abnormalities, myocarditis, or myositis sometimes resembling an acute viral infection. Eosinophilia is often present. Because this disorder is variable in its expression, other organ systems not noted here may be involved. It is important to note that early manifestations of hypersensitivity, such as fever or lymphadenopathy, may be present even though rash is not evident. If such signs or symptoms are present, the patient should be evaluated immediately. Fosphenytoin sodium injection should be discontinued if an alternative etiology for the signs or symptoms cannot be established. Fosphenytoin sodium injection and other hydantoins are contraindicated in patients who have experienced phenytoin hypersensitivity [see Contraindications (4)]. Additionally, consider alternatives to structurally similar drugs such as carboxamides (e.g., carbamazepine), barbiturates, succinimides, and oxazolidinediones (e.g., trimethadione) in these same patients.Similarly, if there is a history of hypersensitivity reactions to these structurally similar drugs in the patient or immediate family members, consider alternatives to fosphenytoin sodium injection. Cases of acute hepatotoxicity, including infrequent cases of acute hepatic failure, have been reported with phenytoin (the active metabolite of fosphenytoin sodium injection). These events may be part of the spectrum of DRESS or may occur in isolation [see Warnings and Precautions(5.5)]. Other common manifestations include jaundice, hepatomegaly, elevated serum transaminase levels, leukocytosis, and eosinophilia. The clinical course of acute phenytoin hepatotoxicity ranges from prompt recovery to fatal outcomes. In these patients with acute hepatotoxicity, fosphenytoin sodium injection should be immediately discontinued and not re-administered. Hematopoietic complications, some fatal, have occasionally been reported in association with administration of phenytoin (the active metabolite of fosphenytoin sodium injection). These have included thrombocytopenia, leukopenia, granulocytopenia, agranulocytosis, and pancytopenia with or without bone marrow suppression. There have been a number of reports that have suggested a relationship between phenytoin and the development of lymphadenopathy (local or generalized), including benign lymph node hyperplasia, pseudolymphoma, lymphoma, and Hodgkin’s disease. Although a cause and effect relationship has not been established, the occurrence of lymphadenopathy indicates the need to differentiate such a condition from other types of lymph node pathology. Lymph node involvement may occur with or without symptoms and signs resembling DRESS [see Warnings and Precautions (5.5)]. Severe burning, itching, and/or paresthesia were reported by 7 of 16 normal volunteers administered IV fosphenytoin sodium injection at a dose of 1,200 mg PE at the maximum rate of administration (150 mg PE/min). The severe sensory disturbance lasted from 3 to 50 minutes in 6 of these subjects and for 14 hours in the seventh subject. In some cases, milder sensory disturbances persisted for as long as 24 hours. The location of the discomfort varied among subjects with the groin mentioned most frequently as an area of discomfort. In a separate cohort of 16 normal volunteers (taken from 2 other studies) who were administered IV fosphenytoin sodium injection at a dose of 1,200 mg PE at the maximum rate of administration (150 mg PE/min), none experienced severe disturbances, but most experienced mild to moderate itching or tingling. Patients administered fosphenytoin sodium injection at doses of 20 mg PE/kg at 150 mg PE/min are expected to experience discomfort of some degree. The occurrence and intensity of the discomfort can be lessened by slowing or temporarily stopping the infusion. The effect of continuing infusion unaltered in the presence of these sensations is unknown. No permanent sequelae have been reported thus far. The pharmacologic basis for these positive sensory phenomena is unknown, but other phosphate ester drugs, which deliver smaller phosphate loads, have been associated with burning, itching, and/or tingling predominantly in the groin area. Edema, discoloration, and pain distal to the site of injection (described as “purple glove syndrome”) have also been reported following peripheral intravenous fosphenytoin sodium injection. This may or may not be associated with extravasation. The syndrome may not develop for several days after injection. Because the fraction of unbound phenytoin (the active metabolite of fosphenytoin sodium injection) is increased in patients with renal or hepatic disease, or in those with hypoalbuminemia, the monitoring of phenytoin serum levels should be based on the unbound fraction in those patients. After IV administration to patients with renal and/or hepatic disease, or in those with hypoalbuminemia, fosphenytoin clearance to phenytoin may be increased without a similar increase in phenytoin clearance. This has the potential to increase the frequency and severity of adverse events. In view of isolated reports associating phenytoin (the active metabolite of fosphenytoin sodium injection) with exacerbation of porphyria, caution should be exercised in using fosphenytoin sodium injection in patients suffering from this disease. Fosphenytoin sodium injection may cause fetal harm when administered to a pregnant woman. Prenatal exposure to phenytoin (the active metabolite of fosphenytoin sodium injection) may increase the risks for congenital malformations and other adverse developmental outcomes [see Use in Specific Populations (8.1)]. A potentially life-threatening bleeding disorder related to decreased levels of vitamin K-dependent clotting factors may occur in newborns exposed to phenytoin in utero. This drug induced condition can be prevented with vitamin K administration to the mother before delivery and to the neonate after birth. A small percentage of individuals who have been treated with phenytoin (the active metabolite of fosphenytoin sodium injection) have been shown to metabolize the drug slowly. Slow metabolism may be caused by limited enzyme availability and lack of induction; it appears to be genetically determined. If early signs of dose-related central nervous system (CNS) toxicity develop, serum levels should be checked immediately. Hyperglycemia, resulting from the inhibitory effect of phenytoin (the active metabolite of fosphenytoin sodium injection) on insulin release, has been reported. Phenytoin may also raise the serum glucose concentrations in diabetic patients. Serum levels of phenytoin (the active metabolite of fosphenytoin sodium injection) sustained above the therapeutic range may produce confusional states referred to as “delirium,” “psychosis,” or “encephalopathy,” or rarely, irreversible cerebellar dysfunction and/or cerebellar atrophy. Accordingly, at the first sign of acute toxicity, serum levels should be immediately checked. Fosphenytoin sodium injection dose reduction is indicated if serum levels are excessive; if symptoms persist, administration of fosphenytoin sodium injection should be discontinued. Because clinical trials are conducted under widely varying conditions, adverse reaction rates observed in the clinical trials of a drug cannot be directly compared to rates in the clinical trials of another drug and may not reflect the rates observed in practice. The more important adverse clinical reactions caused by the IV use of fosphenytoin sodium injection or phenytoin are cardiovascular collapse and/or CNS depression. Hypotension can occur when either drug is administered rapidly by the IV route. The rate of administration is very important; for fosphenytoin sodium injection, it should not exceed 150 mg PE/min [see Warnings and Precautions (5.2)]. The adverse reactions most commonly observed with the use of fosphenytoin sodium injection in clinical trials were nystagmus, dizziness, pruritus, somnolence, and ataxia. With one exception, these reactions are commonly associated with the administration of IV phenytoin. Pruritus, however, was seen much more often following fosphenytoin sodium injection administration and occurred more often with IV fosphenytoin sodium injection administration than with IM fosphenytoin sodium injection administration. These reactions were dose and rate related; most alert patients (41 of 64; 64%) administered doses of ≥15 mg PE/kg at 150 mg PE/min experienced discomfort of some degree. These sensations, generally described as itching, burning, or tingling, were usually not at the infusion site. The location of the discomfort varied with the groin mentioned most frequently as a site of involvement. The paresthesia and pruritus were transient events that occurred within several minutes of the start of infusion and generally resolved within 10 minutes after completion of fosphenytoin sodium injection infusion. Some patients experienced symptoms for hours. These reactions did not increase in severity with repeated administration. Concurrent adverse events or clinical laboratory change suggesting an allergic process were not seen [see Warnings and Precautions (5.9)]. Approximately 2% of the 859 patients who received fosphenytoin sodium injection in premarketing clinical trials discontinued treatment because of an adverse event. The adverse events most commonly associated with withdrawal were pruritus (0.5%), hypotension (0.3%), and bradycardia (0.2%). Dose and Rate Dependency of Adverse Reactions Following IV Fosphenytoin Sodium Injection:The incidence of adverse reactions tended to increase as both dose and infusion rate increased. In particular, at doses of ≥15mg PE/kg and rates ≥150 mg PE/min, transient pruritus, tinnitus, nystagmus, somnolence, and ataxia occurred 2 to 3 times more often than at lower doses or rates. Incidence in Controlled Clinical Trials - IV Administration to Adult Patients with Epilepsy or Neurosurgical Patients: Table 1 lists adverse reactions that occurred in at least 2% of patients treated with IV fosphenytoin sodium injection at the maximum dose and rate in a randomized, double-blind, controlled clinical trial where the rates for phenytoin and fosphenytoin sodium injection administration would have resulted in equivalent systemic exposure to phenytoin. 1 The study was not designed to assess comparative safety. Incidence in Clinical Trials - IV Administration to Pediatric Patients with Epilepsy or Neurosurgical Patients: The overall incidence of adverse reactions and the types of adverse reactions seen were similar among children and adults treated with fosphenytoin sodium injection. In an open-label, safety, tolerability, and pharmacokinetic study of fosphenytoin in pediatric subjects (neonates through age 16), the following adverse reactions occurred at a frequency of at least 5% in 96 subjects treated with intravenous fosphenytoin sodium injection: vomiting (21%), nystagmus (18%), ataxia (10%), fever (8%), nervousness (7%), pruritus (6%), somnolence (6%), hypotension (5%), and rash (5%). Incidence in Controlled Trials - IM Administration to Adult Patients with Epilepsy: Table 2 lists adverse reactions that occurred in at least 2% of fosphenytoin sodium injection-treated patients in a double-blind, randomized, controlled clinical trial of adult epilepsy patients receiving either IM fosphenytoin sodium injection substituted for oral phenytoin or continuing oral phenytoin. Both treatments were administered for 5 days. 1The study was not designed to assess comparative safety. Fosphenytoin sodium injection has been administered to approximately 900 individuals during clinical trials. Adverse events seen at least twice are listed in the following, except those already included in previous tables and listings. Events are further classified within body system categories and enumerated in order of decreasing frequency using the following definitions: frequent adverse events are defined as those occurring in greater than 1/100 individuals; infrequent adverse events are those occurring in 1/100 to 1/1,000 individuals. Cardiovascular: Frequent: hypertension; Infrequent: cardiac arrest, migraine, syncope, cerebral hemorrhage, palpitation, sinus bradycardia, atrial flutter, bundle branch block, cardiomegaly,cerebral infarct, postural hypotension, pulmonary embolus, QT interval prolongation, thrombophlebitis, ventricular extrasystoles, congestive heart failure. Laboratory Test Abnormality: Phenytoin (the active metabolite of fosphenytoin sodium injection) may cause increased serum levels of glucose and alkaline phosphatase. Laboratory Test Abnormality: Phenytoin or fosphenytoin sodium injection may decrease serum concentrations of T4. It may also produce lower than normal values for dexamethasone or metyrapone tests. Phenytoin may also cause increased serum levels of gamma glutamyl transpeptidase (GGT). Fosphenytoin is extensively bound to human plasma proteins. Drugs highly bound to albumin could increase the unbound fraction of fosphenytoin. Although, it is unknown whether this could result in clinically significant effects, caution is advised when administering fosphenytoin sodium injection with other drugs that significantly bind to serum albumin. The most significant drug interactions following administration of fosphenytoin sodium injection are expected to occur with drugs that interact with phenytoin. Phenytoin is extensively bound to serum plasma proteins and is prone to competitive displacement. Phenytoin is metabolized by hepatic cytochrome P450 enzymes CYP2C9 and CYP2C19 and is particularly susceptible to inhibitory drug interactions because it is subject to saturable metabolism. Inhibition of metabolism may produce significant increases in circulating phenytoin concentrations and enhance the risk of drug toxicity. Monitoring of phenytoin serum levels is recommended when a drug interaction is suspected. Phenytoin or fosphenytoin sodium injection is a potent inducer of hepatic drug-metabolizing enzymes. Table 3 includes commonly occurring drug interactions that affect phenytoin (the active metabolite of fosphenytoin sodium injection) concentrations. However, this list is not intended to be inclusive or comprehensive. Individual prescribing information from relevant drugs should be consulted. Table 4 includes commonly occurring drug interactions affected by phenytoin (the active metabolite of fosphenytoin sodium injection). However, this list is not intended to be inclusive or comprehensive. Individual drug package inserts should be consulted. The addition or withdrawal of phenytoin during concomitant therapy with these agents may require adjustment of the dose of these agents to achieve optimal clinical outcome. Prevention or Management:Patients should be monitored closely for more rapid recovery from neuromuscular blockade than expected, and infusion rate requirements may be higher. Care should be taken when using immunoanalytical methods to measure serum phenytoin concentrations following fosphenytoin sodium injection administration. There is a pregnancy exposure registry that monitors pregnancy outcomes in women exposed to antiepileptic drugs (AEDs), such as fosphenytoin sodium injection, during pregnancy. Physicians are advised to recommend that pregnant patients taking fosphenytoin sodium injection enroll in the North American Antiepileptic Drug (NAAED) Pregnancy Registry. This can be done by calling the toll free number 1-888-233-2334, and must be done by patients themselves.Information on the registry can also be found at the website http://www.aedpregnancyregistry.org/. In humans, prenatal exposure to phenytoin (the active metabolite of fosphenytoin sodium injection) may increase the risks for congenital malformations and other adverse developmental outcomes. Prenatal phenytoin exposure is associated with an increased incidence of major malformations, including orofacial clefts and cardiac defects. In addition, the fetal hydantoin syndrome, a pattern of abnormalities including dysmorphic skull and facial features, nail and digit hypoplasia, growth abnormalities (including microcephaly), and cognitive deficits has been reported among children born to epileptic women who took phenytoin alone or in combination with other antiepileptic drugs during pregnancy [see ]. There have been several reported cases of malignancies, including neuroblastoma, in children whose mothers received phenytoin during pregnancy. A potentially life-threatening bleeding disorder related to decreased levels of vitamin Kdependent clotting factors may occur in newborns exposed to phenytoin in utero. This druginduced condition can be prevented with vitamin K administration to the mother before delivery and to the neonate after birth. It is not known whether fosphenytoin is secreted in human milk. Following administration of phenytoin (the active metabolite of fosphenytoin sodium injection), phenytoin is secreted in human milk. The developmental and health benefits of breastfeeding should be considered along with the mother’s clinical need for fosphenytoin sodium injection and any potential adverse effects on the breastfed infant from fosphenytoin sodium injection or from the underlying maternal condition. Fosphenytoin sodium injection is indicated for the treatment of generalized tonic-clonic status epilepticus and prevention and treatment of seizures occurring during neurosurgery in all pediatric age groups [see Indications and Usage (1)and Dosage and Administration (2.3, 2.4)].Because rapid intravenous administration of fosphenytoin sodium injection increases the risk of adverse cardiovascular reactions, the rate of administration should not exceed 2 mg PE/kg/min (or 150 mg PE/min, whichever is slower) in pediatric patients [see Dosage and Administration(2.3, 2.4) and Warnings and Precautions (5.2)]. Because the fraction of unbound phenytoin (the active metabolite of fosphenytoin sodium injection) is increased in patients with renal or hepatic disease, or in those with hypoalbuminemia, the monitoring of phenytoin serum levels should be based on the unbound fraction in those patients. Nausea, vomiting, lethargy, tachycardia, bradycardia, asystole, cardiac arrest, hypotension, syncope, hypocalcemia, metabolic acidosis, and death have been reported in cases of overdosage with fosphenytoin sodium injection. Because fosphenytoin sodium injection is a prodrug of phenytoin, the following information about phenytoin overdosage may be helpful. Initial symptoms of acute phenytoin toxicity are nystagmus, ataxia, and dysarthria. Other signs include tremor, hyperreflexia, lethargy, slurred speech, nausea, vomiting, coma, and hypotension. Death is caused by respiratory and circulatory depression. The lethal dose of phenytoin in adults is estimated to be 2 to 5 grams. The lethal dose in pediatrics is not known. There are marked variations among individuals with respect to serum phenytoin concentrations where toxicity occurs. Lateral gaze nystagmus usually appears at 20 mcg/mL, ataxia at 30 mcg/mL, and dysarthria and lethargy appear when the serum concentration is over 40 mcg/mL. However, phenytoin concentrations as high as 50 mcg/mL have been reported without evidence of toxicity. As much as 25 times the therapeutic phenytoin dose has been taken, resulting in serum phenytoin concentrations over 100 mcg/mL, with complete recovery. Irreversible cerebellar dysfunction and atrophy have been reported after overdosage. Formate and phosphate are metabolites of fosphenytoin sodium injection and therefore may contribute to signs of toxicity following overdosage. Signs of formate toxicity are similar to those of methanol toxicity and are associated with severe anion-gap metabolic acidosis. Large amounts of phosphate, delivered rapidly, could potentially cause hypocalcemia with paresthesia, muscle spasms, and seizures. Ionized free calcium levels can be measured and, if low, used to guide treatment. Treatment: Treatment is nonspecific since there is no known antidote to fosphenytoin sodium injection or phenytoin overdosage. The adequacy of the respiratory and circulatory systems should be carefully observed, and appropriate supportive measures employed. Hemodialysis can be considered since phenytoin (the active metabolite of fosphenytoin sodium injection) is not completely bound to plasma proteins. Total exchange transfusion has been used in the treatment of severe intoxication in children. Fosphenytoin Sodium Injection, USP is a prodrug intended for parenteral administration; its active metabolite is phenytoin. 1.5 mg of fosphenytoin sodium, USP is equivalent to 1 mg phenytoin sodium, and is referred to as 1 mg phenytoin sodium equivalents (PE). The amount and concentration of fosphenytoin is always expressed in terms of mg PE. Fosphenytoin sodium injection, USP is marketed in 2 mL vials containing a total of 100 mg PE and 10 mL vials containing a total of 500 mg PE. The concentration of each vial is 50 mg PE/mL. Fosphenytoin sodium injection, USP is supplied in vials as a ready-mixed solution in water for injection, USP, and tromethamine, USP (TRIS), buffer adjusted to pH 8.6 to 9 with either hydrochloric acid, NF, or sodium hydroxide, NF. Fosphenytoin sodium injection, USP is a clear, colorless to pale yellow, sterile solution. The molecular weight of fosphenytoin is 406.24 and chemical formula for fosphenytoin sodium is C16H13NA2O5P. IMPORTANT NOTE: Throughout all Fosphenytoin Sodium Injection, USP product labeling, the amount and concentration of fosphenytoin are always expressed in terms of phenytoin sodium equivalents (PE). Fosphenytoin’s weight is expressed as phenytoin sodium equivalents to avoid the need to perform molecular weight-based adjustments when substituting fosphenytoin for phenytoin or vice versa. Care should be taken to ensure that Fosphenytoin Sodium Injection, USP is always prescribed and dispensed in phenytoin sodium equivalents (PE) (see DOSAGE AND ADMINISTRATION). Intravenous: When fosphenytoin sodium injection is administered by IV infusion, maximum plasma fosphenytoin concentrations are achieved at the end of the infusion. Intramuscular: Fosphenytoin is completely bioavailable following IM administration of fosphenytoin sodium injection. Peak concentrations occur at approximately 30 minutes postdose. Plasma fosphenytoin concentrations following IM administration are lower but more sustained than those following IV administration due to the time required for absorption of fosphenytoin from the injection site. Following parenteral administration of fosphenytoin sodium injection, fosphenytoin is converted to the anticonvulsant phenytoin. The mechanism of fosphenytoin conversion has not been determined, but phosphatases probably play a major role. Fosphenytoin is metabolized to phenytoin, phosphate, and formate. For every mmol of fosphenytoin administered, one mmol of phenytoin is produced. The hydrolysis of fosphenytoin to phenytoin yields two metabolites, phosphate and formaldehyde. Formaldehyde is subsequently converted to formate, which is in turn metabolized via a folate dependent mechanism. Although phosphate and formaldehyde (formate) have potentially important biological effects, these effects typically occur at concentrations considerably in excess of those obtained when fosphenytoin sodium injection is administered under conditions of use recommended in this labeling. In general, IM administration of fosphenytoin sodium injection generates systemic phenytoin concentrations that are similar enough to oral phenytoin sodium to allow essentially interchangeable use. The pharmacokinetics of fosphenytoin following IV administration of fosphenytoin sodium injection, however, are complex, and when used in an emergency setting (e.g., status epilepticus), differences in rate of availability of phenytoin could be critical. Studies have therefore empirically determined an infusion rate for fosphenytoin sodium injection that gives a rate and extent of phenytoin systemic availability similar to that of a 50 mg/min phenytoin sodium infusion. A dose of 15 to 20 mg PE/kg of fosphenytoin sodium injection infused at 100 to 150 mg PE/min yields plasma free phenytoin concentrations over time that approximate those achieved when an equivalent dose of phenytoin sodium (e.g., parenteral DILANTIN®) is administered at 50 mg/min [see Dosage and Administration (2.3)andWarnings and Precautions (5.2)]. FIGURE 1. Mean plasma unbound phenytoin concentrations following IV administration of 1,200 mg PE fosphenytoin sodium injection infused at 100 mg PE/min (triangles) or 150 mg PE/min (squares) and 1,200 mg Dilantin infused at 50 mg/min (diamonds) to healthy subjects (N = 12). Inset shows time course for the entire 96-hour sampling period. Following administration of single IV fosphenytoin sodium injection doses of 400 to 1,200 mg PE, mean maximum total phenytoin concentrations increase in proportion to dose, but do not change appreciably with changes in infusion rate. 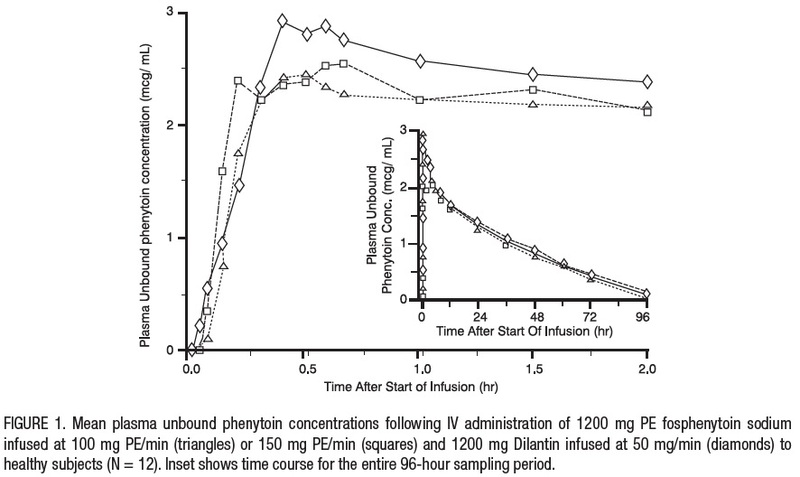 In contrast, mean maximum unbound phenytoin concentrations increase with both dose and rate. Mean total phenytoin half-life values (12.0 to 28.9 hr) following fosphenytoin sodium injection administration at these doses are similar to those after equal doses of parenteral Dilantin and tend to be greater at higher plasma phenytoin concentrations. Phenytoin derived from administration of fosphenytoin sodium injection is extensively metabolized in the liver by the cytochrome P450 enzymes CYP2C9 and CYP2C19. Phenytoin hepatic metabolism is saturable,and following administration of single IV fosphenytoin sodium injection doses of 400 to 1,200 mg PE, total and unbound phenytoin AUC values increase disproportionately with dose. Phenytoin derived from administration of fosphenytoin sodium injection is excreted in urine primarily as 5-(p-hydroxyphenyl)-5-phenylhydantoin and its glucuronide; little unchanged phenytoin (1% to 5% of the fosphenytoin sodium injection dose) is recovered in urine. Increased fraction of unbound phenytoin (the active metabolite of fosphenytoin sodium injection) in patients with renal or hepatic disease, or in those with hypoalbuminemia has been reported. It has been reported in the literature that the plasma clearance of phenytoin (the active metabolite of fosphenytoin sodium injection) generally increased during pregnancy, reached a peak in the third trimester and returned to the level of pre-pregnancy after few weeks or months of delivery [see Dosage and Administration (2.9)]. Phenytoin derived from administration of fosphenytoin sodium injection is extensively metabolized in the liver by the cytochrome P450 enzymes CYP2C9 and CYP2C19 [see Drug Interactions (7.1, 7.2)]. No drugs are known to interfere with the conversion of fosphenytoin to phenytoin. Conversion could be affected by alterations in the level of phosphatase activity, but given the abundance and wide distribution of phosphatases in the body it is unlikely that drugs would affect this activity enough to affect conversion of fosphenytoin to phenytoin. In carcinogenicity studies reported in the literature, phenytoin was administered in the diet for 2 years at doses up to 600 ppm (approximately 90 mg/kg/day) to mice and up to 2,400 ppm (approximately 120 mg/kg/day) to rats. The incidences of hepatocellular tumors were increased in female mice at all but the lowest dose tested. No increases in tumor incidence were observed in rats. Infusion tolerance was evaluated in clinical studies. One double-blind study assessed infusion-site tolerance of equivalent loading doses (15 to 20 mg PE/kg) of fosphenytoin sodium injection infused at 150 mg PE/min or phenytoin infused at 50 mg/min. The study demonstrated better local tolerance (pain and burning at the infusion site), fewer disruptions of the infusion, and a shorter infusion period for fosphenytoin sodium injection-treated patients (Table 5). Fosphenytoin sodium injection-treated patients, however, experienced more systemic sensory disturbances [see Warnings and Precautions (5.9)]. Infusion disruptions in fosphenytoin sodium injection-treated patients were primarily due to systemic burning, pruritus, and/or paresthesia while those in phenytoin-treated patients were primarily due to pain and burning at the infusion site (see Table 5). In a double-blind study investigating temporary substitution of fosphenytoin sodium injection for oral phenytoin, IM fosphenytoin sodium injection was as well-tolerated as IM placebo. IM fosphenytoin sodium injection resulted in a slight increase in transient, mild to moderate local itching (23% of fosphenytoin sodium injection-treated patients vs 11% of IM placebo-treated patients at any time during the study). This study also demonstrated that equimolar doses of IM fosphenytoin sodium injection may be substituted for oral phenytoin sodium with no dosage adjustments needed when initiating IM or returning to oral therapy. In contrast, switching between IM and oral phenytoin requires dosage adjustments because of slow and erratic phenytoin absorption from muscle. Mg of phenytoin sodium, USP. Both sizes of vials contain tromethamine, USP (TRIS), hydrochloric acid, NF or sodium hydroxide, NF and water for injection, USP. Fosphenytoin Sodium Injection, USP should always be prescribed in phenytoin sodium equivalent (PE) (see DOSAGE AND ADMINISTRATION). 1.5 mg of fosphenytoin sodium is equivalent to 1 mg phenytoin sodium, and is referred to as 1 mg PE. The amount and concentration of fosphenytoin is always expressed in terms of mg of phenytoin sodium equivalents (PE). Fosphenytoin’s weight is expressed as phenytoin sodium equivalents to avoid the need to perform molecular weight-based adjustments when substituting fosphenytoin for phenytoin or vice versa. Store under refrigeration at 2° to 8°C (36° to 46°F). The product should not be stored at room temperature for more than 48 hours. Vials that develop particulate matter should not be used. Advise patients not to discontinue use of fosphenytoin sodium injection without consulting with their healthcare provider. fosphenytoin sodium injection should normally be gradually withdrawn to reduce the potential for increased seizure frequency and status epilepticus [see Warnings and Precautions (5.3)]. Advise patients of the early toxic signs and symptoms of potential hematologic, dermatologic, hypersensitivity, or hepatic reactions. These symptoms may include, but are not limited to, fever, sore throat, rash, ulcers in the mouth, easy bruising, lymphadenopathy, facial swelling, and petechial or purpuric hemorrhage, and in the case of liver reactions, anorexia, nausea/vomiting, or jaundice. Advise the patient that, because these signs and symptoms may signal a serious reaction, that they must report any occurrence immediately to a physician. In addition, advise the patient that these signs and symptoms should be reported even if mild or when occurring after extended use [see Warnings and Precautions (5.4, 5.5, 5.6, 5.7, 5.8)]. Advise patients that fosphenytoin sodium injection may cause an increase in blood glucose levels [see Warnings and Precautions (5.16)]. Inform pregnant women and women of childbearing potential that use of fosphenytoin sodium injection during pregnancy can cause fetal harm, including an increased risk for cleft lip and/or cleft palate (oral clefts), cardiac defects, dysmorphic skull and facial features, nail and digit hypoplasia, growth abnormalities (including microcephaly), and cognitive deficits. When appropriate, counsel pregnant women and women of childbearing potential about alternative therapeutic options. Advise women of childbearing potential who are not planning a pregnancy to use effective contraception while using fosphenytoin sodium injection, keeping in mind that there is a potential for decreased hormonal contraceptive efficacy [see Drug Interactions (7.2)].